In the last step we explored sounds that were made in the same place in the mouth as English vowels, with variations on lip-rounding (losing it in a place where we English speakers normally have rounding [u] → [ɯ], gaining it in a place where we normally lack rounding [i] → [y].) In this step, we'll be explorinɡ a sound that is made in a place in the mouth where no General American or Standard British vowel lies (though there may be a vowel made there for other regional accents of English, like Scots for instance). To review, in the last two steps we were gliding between a front close vowel and a back close vowel, that is, with the tongue "close" to the roof of the mouth, arching forward toward the front, or arching backward toward the back. Now, we're going to try to find a vowel sound in between "front" and "back", in an area phoneticians call "central." To find the "central" spot, we're going to go back to the gliding-between-front-and-back process and slow it down. If we slow it down enough that we don't jump between the two sounds but truly slide through the potential vowels that lie between the front and back positions, we can stop half-way and find the central position. I find that it is easiest to start this exploration with the lips rounded, as that lip position creates an intense vibration in the mouth and face, and may make it easier to feel your way through the process. So start with your tongue arched back with lips rounded intensely in an "oo" [u] vowel. Now, locking your lips into that shape, very slowly glide forward along the roof of your mouth toward the [y] vowel. Glide slowly back again to your starting place at [u], and then start again. But this time, stop halfway through. This is the central position, and the IPA symbol for this sound is [ʉ]. (This vowel is used in Scots dialect in words in the goose and foot lexical sets.) 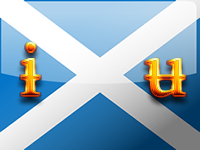 This vowel is sometimes represented in Scots writings with an alternate spelling, such as "guid" for "good." We can switch from [ʉ] to our next "new" vowel by merely letting go of the rounding, and spreading the lips. This should make a somewhat back (i.e. central) version of the /i/ vowel. The IPA generally uses the crossbar to represent the centering principle (as in [ʉ]), so naturally the symbol for the central [i] is [ɨ]. This sound is perhaps a little less useful than the barred-u sound, as there are fewer accents that use it. I've seen people use the symbol to describe a central, unrounded version of the goose and foot lexical sets. Oddly enough, I've appropriated the barred-i symbol for use in the pretty set in teaching IPA to actors. This usage is perhaps not "strictly ballroom," as the sound I often hear in many speakers from a variety of backgrounds is not quite so much central as it is halfway between the fleece and kit sounds, [i] and [ɪ]. In the next step, we'll look at the rest of the non-English vowels by looking at variations in rounding and centralizing the vowels we already know. Should be fun!